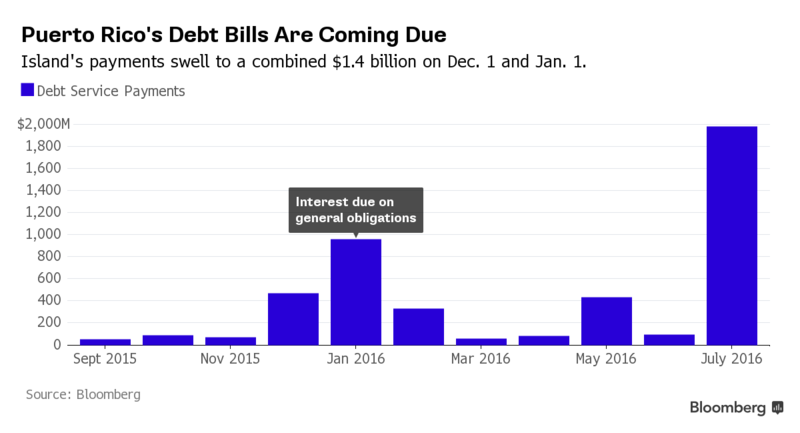 Welcome to Puerto Rico Default Day! Puerto Rico won’t be making 2 of the 13 debt payments due on Jan. 4 – a $35.9M payment on the territory’s Infrastructure Financing Authority, and a $1.4M payment on its Public Finance Corporation. The rest of the nearly $1B in payments due on Monday will be made, including one to general obligation bondholders in which half of the payment comes from revenues clawed back from other bonds. I am not seeing how this is supposed to work. They are just not making about $40 million in payments… but are making the $1 billion? Can we see that one of these numbers is much much bigger than the others? On Nov. 30, Puerto Rico Governor Alejandro Garcia Padilla enacted an unprecedented executive order to implement a “clawback” measure that would redirect money pledged to select tax-supported bonds in order to meet the GO obligation, which is backed by the commonwealth’s constitution. In a call with reporters shortly before scheduled public remarks midday Wednesday [December 30], Puerto Rican officials noted that since an executive order, no further payments have been made into the trusts, for which payments are drawn, on all three of the clawed back bonds — HTA, PRIFA, CCDA — constituting a default. Puerto Rico first defaulted on a payment due to bond holders of the Public Finance Corporation, a subsidiary of the island’s Government Development Bank, in August when it failed to make the full $58 million due. Since that historic default, the PFC has missed every monthly payment due to bondholders, which now totals $63.4 million. In the U.S., Obama administration officials said the default reflected the depth of Puerto Rico’s debt problems and the importance of Congress acting in the form of an aid package. Here is my post on the August default. — as with the above graph, much smaller than what was needed for the January payment. Here’s the problem with governmental bankruptcy: it’s hard to sue governmental entities… and collect. When there’s no overriding authority and process, the government will decide who gets repaid and who doesn’t. A process like federal bankruptcy, say, with an overriding authority of federal courts. First off, the original bondholders who thought “well, they can’t go (legally) bankrupt” were essentially betting on a government bailout. They had to have known that Puerto Rico could not have repaid that debt without U.S. federal government financing. They had been making a political calculation in assuming that the U.S. federal government would bar formal bankruptcy proceedings, but that still wouldn’t make them whole. Yes, there are individual investors who may have thought “government doesn’t go out of business”, but they’re not the ones hiring lobbyists. Second, Puerto Rico does not have the money to pay all their obligations. They are bankrupt in fact. Setting up a formal process to have the various parties treated in public with agreements on the record is not a bailout. It does not make new money come into being. Yes, some creditors will get less in bankruptcy than if they get to grab at PR’s assets individually through the courts. They have lawyers (you better believe they have lawyers) and may have felt they could outgame their competitors in getting what cash was available. There are “vulture investors” on both sides here. Some feel they will get more in this piecemeal process. Some have already lost money and want to make sure they’re treated no worse than other creditors. Remember that the bond mutual funds are primarily owned by individuals. The vast majority of people being hit will not be the hedge funds. The $15 billion held by hedge funds is a little over 20% of the debt. I am sure they were betting that Puerto Rico can pay at least 20% of their debt… and they’ve got the lawyers. I am among those who hold for formal bankruptcy processes for governmental borrowers. It levels the playing field for smaller investors, in my opinion, and is more public. I am not predicting how the lobbying will shake out re: bankruptcy legalization. I hope it will occur, but there’s more than just Puerto Rico at stake in bankruptcy legalization. And, of course, there are other cities in worse shape: Detroit, for example, or Baltimore, where the Freddie Gray murder trial has led to months of convulsions. Bill de Blasio’s New York is doing better than Chicago, but faces many of the same problems. And Blue Model Puerto Rico is headed for another default as well. Many of these jurisdictions will probably be coming, hat in hand, to ask for federal bailouts. But the federal government, though it can — and does — print money, is also on a shaky financial foundation, and there’s no great appetite by taxpayers to bail out failing polities. Mead thinks that feds will demand “reform for relief,” but will voters trust politicians to reform, after so many disappointments? Trust in government isn’t exactly plentiful now. And, looking at Rahm Emanuel’s Chicago, why should it be? As I said in my own predictions, there will be no bailouts of these governmental deadbeats. Puerto Rico is chump change next to Chicago and Illinois. I will come back to that another day. There are parties interested in making sure that bigger fry than Puerto Rico won’t be declaring bankruptcy. And parties interested in making sure that they will. No clue how that will end, but I will bet it won’t be resolved this year.